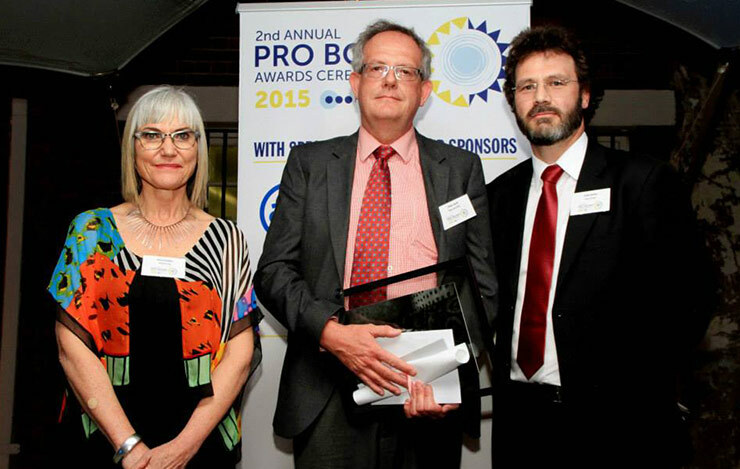 The 2nd Annual Pro Bono Awards Ceremony was held at the Constitutional Hill in Johannesburg on 17 September 2015. 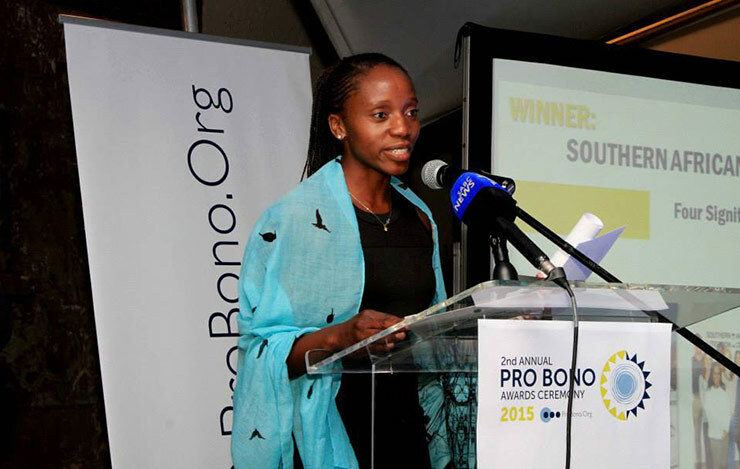 Angela Mudukuti - Southern Africa Litigation Centre. Winner of Human RIghts Champion Award. 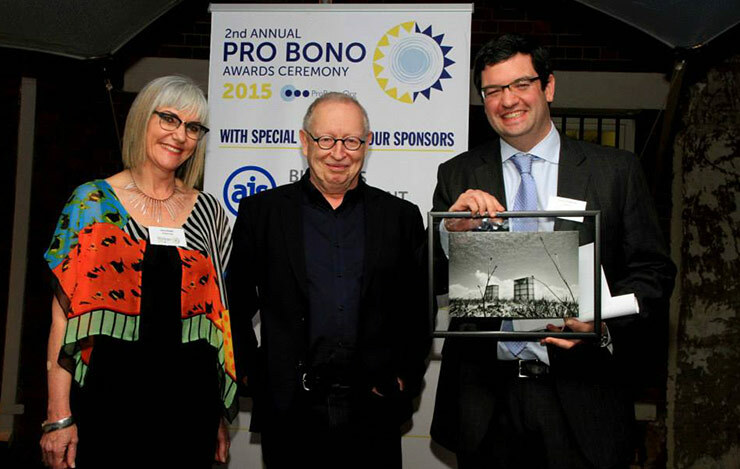 2015 Pro Bono Awards Ceremony. 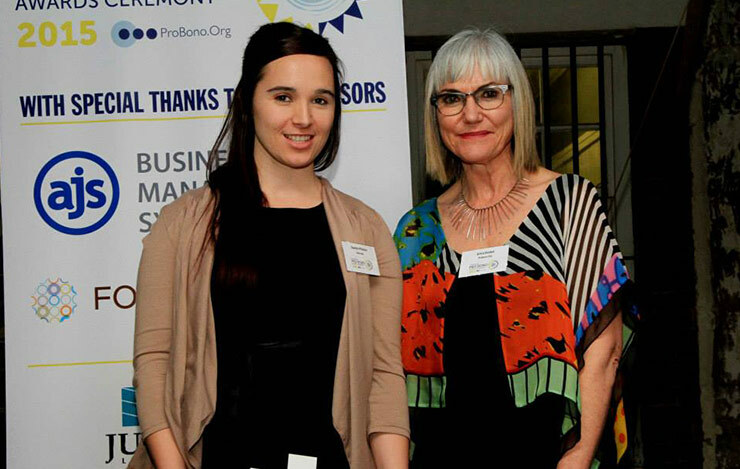 Danelle Prinsloo - Winner of Legal Clinic Law Student. advice office work. WIth Andy Bester and Erica Emdon. 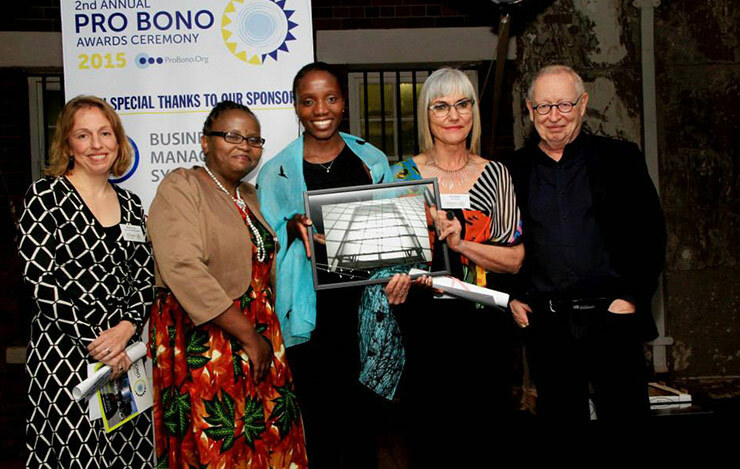 Norman Moabi - awarded National Director's Special Mention for work at Funanani Centre. WIth Erica Emdon and Andy Bester. actions against the police. WIth Erica Emdon and Andy Bester. Human Rights Champion Award. With Erica Emdon and David Lewis. (Webber Wentzel). Finalists for most impactful case award. 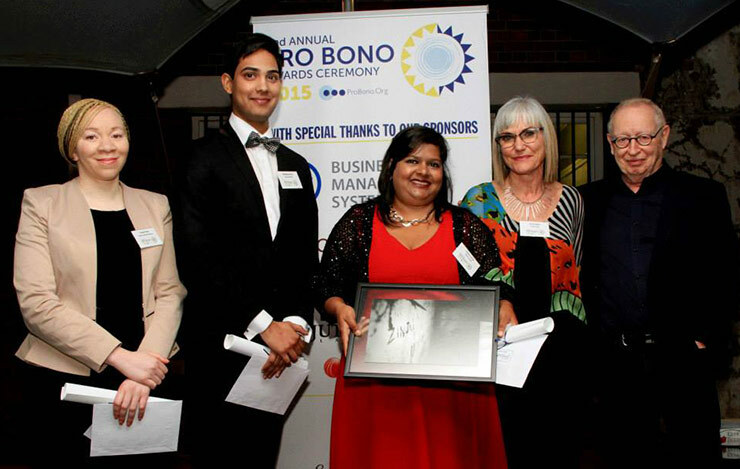 Tshego Phala (Webber Wentzel), Mohammed Saib (Bowman Gilfillan) and Candice Pillay (Hogan Lovells). Finalists for children's rights award. 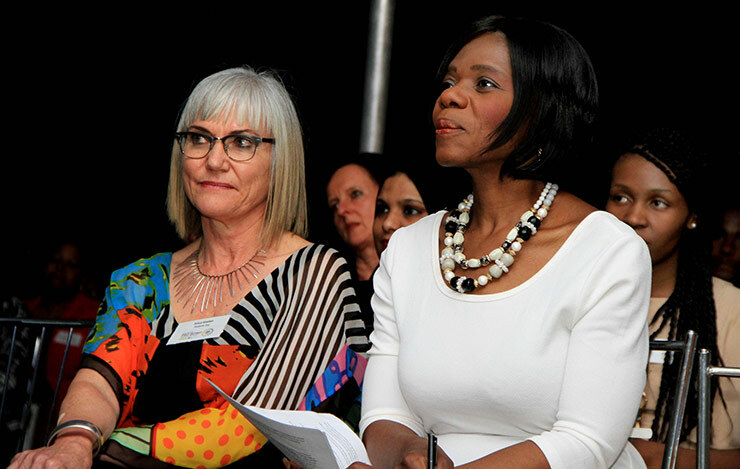 We were honoured to have the Public Protector, Thuli Madonsela as our Keynote speaker. Greetings from the Public Protector South Africa Team! It is indeed a singular honour and privilege to join this esteemed gathering of our country’s legal minds and to say a few words on the importance of access to justice. 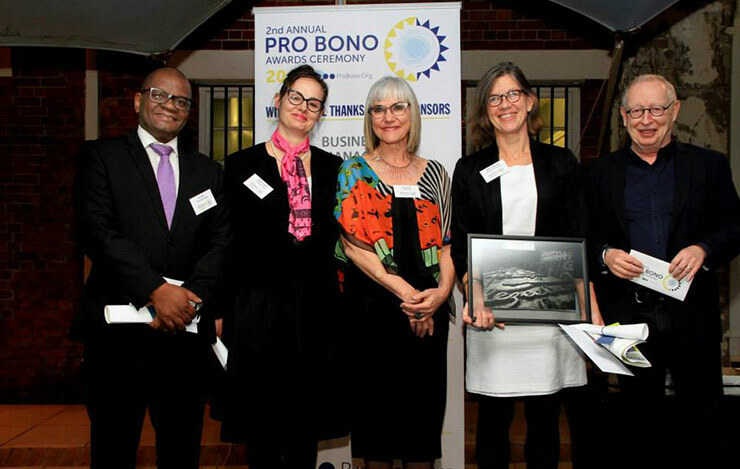 I thank ProBono.org for involving me and my office and for bringing us together tonight to pay tribute to the champions of legal empowerment of the poor or disadvantaged persons. Congratulations to all the winners. As you already know, through lifting others we lift ourselves. Congratulations are also due to all the nominees and others providing legal services to those who cannot afford. Just for doing the work you are doing advancing social justice by lifting others you too are winners. Your work is important. assistance to the increasing diversity of dispute resolution forums in our landscape, which include my office, the Public Protector. 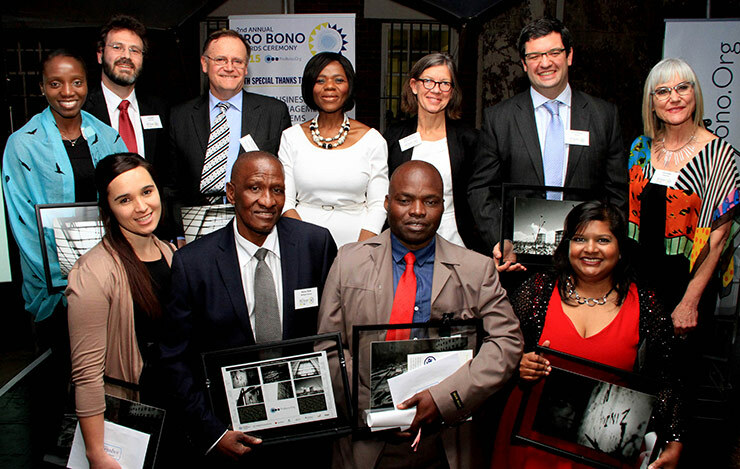 The timing of today’s celebration of champions of probono legal work as a vehicle for legal empowerment of the disadvantaged among us, neatly coincides with Access to Justice Week. When we initiated access to Justice Week as SAWLA and the Department of Justice in 2007, we did so like you, in recognition of the importance of extending legal services to the disadvantaged as part of broader access to justice. Your role as providers of free legal advice and representation to those who cannot afford can never be overestimated. Access to justice, incorporating access to legal advice and or representation, is one of the essentials of the rule of law. I hope you will agree with me that the essence of access to justice is the opportunity for a victim of injustice or person involved in a dispute to readily access a forum that can listen to his or her grievance and/or resolve their dispute in a fair and expeditious manner that leads to redress where deserved. I hope you will also agree with me that without a chance to understand or to be understood at whatever forum that deals with your grievance or dispute, there is no access to justice. told to vacate a home she had shared for nearly two decades and personally renovated. She lost furniture she had paid for and a taxi and other cars she had paid for and had receipts to show. All she knew was the court number where everything happened. She did not know the capacity of the people who had dealt with her. Thanks to our Constitution and the Recognition of Customary Marriages Act, such horror stories are rare today. But are they behind us? What are the Implications of Lack of Access to Justice for Democracy, Development and the Rule of Law? Even during the darkest days of apartheid, access to justice opportunities minimised the sting of oppression. 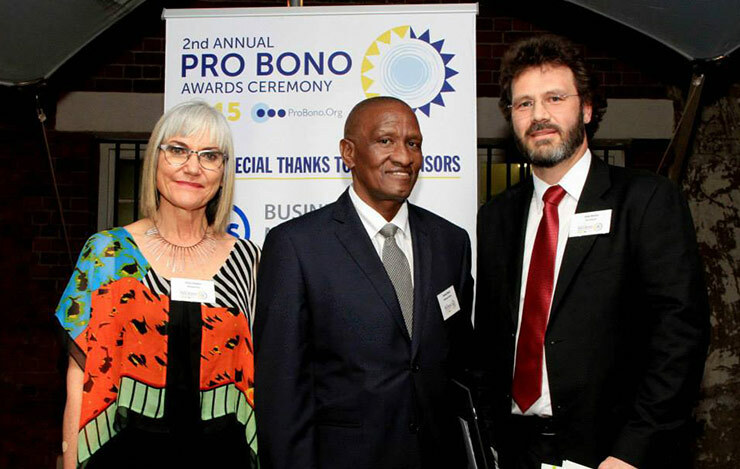 It was probono legal activities that helped the oppressed black majority challenge racial discrimination, forced removals and exclusion from democratic processes, among others. Some of the outcomes eased the suffering of the affected majority and pushed back the oppressive claws of apartheid. Examples in this regard include administrative justice, human rights and employment rights. In this regard, we recall the work of institutions such as the Legal Resources Centre, Lawyers for Human Rights and The Transvaal Rural Action Committee (TRAC), among others. We also remember the work of individual lawyers such as Cissie Gool, Braam Fischer, Sydney & Felicia Kentridge, Griffiths & Victoria Mxenge, Ismail Mahomed, George Bozos, Priscilla Jana, John Campbell and the recently departed Justices Pius Langa and Lewis Skweyiya, among many. Why is it important that all experience access to justice? The World Justice Forum, which places the rule of law at the centre of societal peace and progress, regards access to justice, incorporating legal empowerment of the poor, as an essential part of the rule of law. Part of it relates to the legitimacy of the state. I prefer to see it as our collective insurance for peace and stability. At the core of it is accountability. You will agree with me that democracy, progress and sustainable peace to be experienced by any society, its citizens should have mechanisms to have their grievances resolved fairly and wrongs redressed. If people don’t think there are fair outlets for their grievances or disputes, they are likely to take the law into their hands. They may not do it today or tomorrow but they will eventually do it. The requirement of credible justice avenues also applies to people feeling that those who exercise entrusted public power are not treated as individuals or collectives unfairly. Where people believe they’ve been wronged, there must be a readily available independent platform to resolve the grievance or dispute fairly. It’s not enough that the system is fair it must be manifestly or experienced as fair. 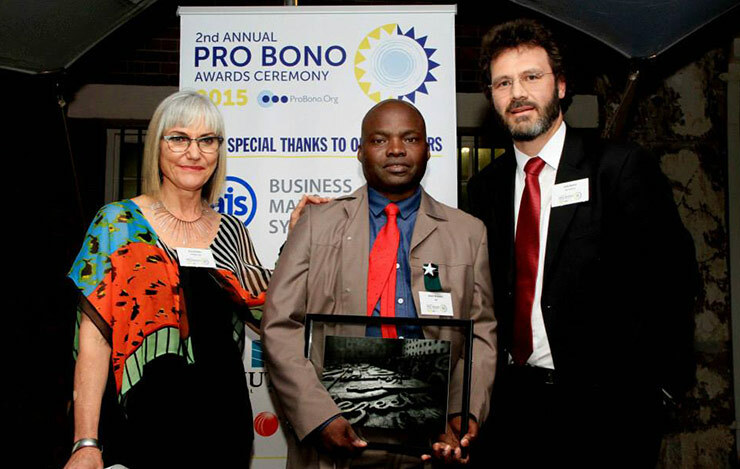 This is another entry point for probono legal services. Free legal advice can and has over the years assisted by enhancing the right to understand and to be understood. In this regard ensuring legal empowerment of the poor, transcends legal advice/representation and includes legal education. The area of legal education though is one where we need improvement. Although there have always been services such as Street Law, I believe law students could be mobilised more meaningfully to make laws, particularly new laws, accessible to the public. Legal education also has the added dimension of preventing or reducing infringement. Knowing the law and related regulatory frameworks empowers all to participate meaningfully in democracy, development and other societal processes. It further fosters respect for the rule of law. We all understand that crime hurts and that both victims and accused persons deserve access to justice. Over the years we’ve also come to accept the importance of access to justice in civil matters. Regarding civil matters we’ve also invested a lot of resources in small claims courts to ensure that the average person, whom in my office we refer to as Gogo Dlamini, has a no frills forum to resolve his or her small but to him/her important civil disputes. The budget and number of small claims courts have rightly increased exponentially since the dawn or democracy. But what about a Gogo Dlamini who is facing the state with its Goliath like bureaucratic power and resources? As you know disputes involving the state are excluded from the remit of the small claims court. In other words a Gogo Dlamini can take her neighbour to a small claims court for a small civil matter (R15 000.00) but if it’s the state she cannot do the same with government. In my 6 years as Public Protector, I’ve come to realise that we underestimate the harm or injustice caused by maladministration and abuse of power in state affairs. Fortunately the architects of our democracy knew that the state may harm people whether benevolently or maliciously. 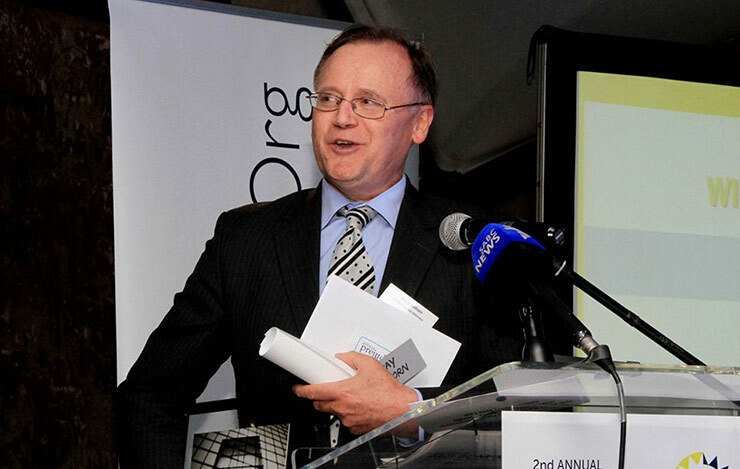 It was for this reason that innovative structures such as the Public Protector and other Institutions Supporting Constitutional Democracy, including the South African Human Rights Commission, Commission for Gender Equality, Electoral Commission, Commission on the Protection and Promotion of the Rights of Cultural, Religious and Linguistic Communities and the Auditor General, were given a special place in chapter 9 of our visionary Constitution. Initially established in 1979 (In terms of the Advocate General Act 118 of 1979) as a graft buster, the office I head has undergone a metamorphosis over the years. A statutory body in the Department of Justice with no executive authority of its own, the Public Protector’s powers then were similar to the Auditor General’s and a commission of inquiry being to investigate, report and advise or recommend to those with power to execute, principally the Executive. By 1991, the law-makers saw it fit to extend the office’s powers to include Ombudsman related violations such as maladministration, abuse of power, undue delay, etc. When the Interim Constitution was passed in 1993, it changed the name but not the functions of the office and so did the Public Protector Act of 1994. To take appropriate remedial action. 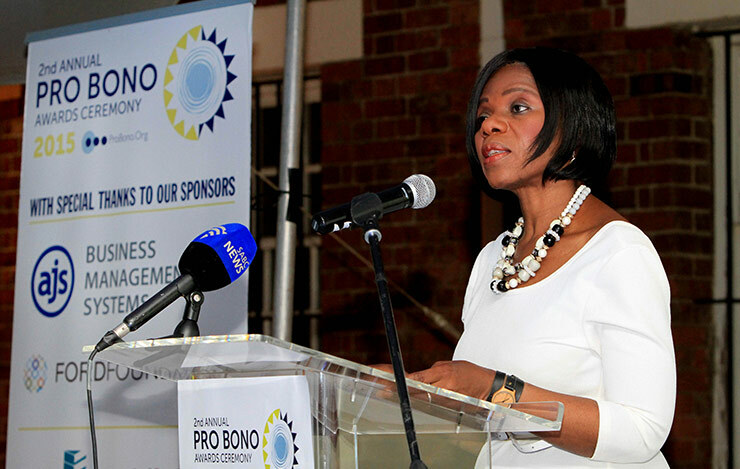 (2) The Public Protector has additional powers and functions prescribed by national legislation. (3) The Public Protector may not investigate court decisions. (4) The Public Protector must be accessible to all persons and communities. From an access to justice point of view, my take is that the Constitution gives a Gogo Dlamini who chooses the Public Protector as an avenue to mediate power between her and the mighty bureaucratic state, a similar opportunity to the Gogo Dlamini who approaches to a small claims court to have her grievance or dispute resolved. I believe that access to justice for both Gogo Dlamini’s includes with redress or remedial action where deserved or injustice confirmed. I further believe that section 182(4) gives Gogo Dlamini the right to have the Public Protector properly funded and accessible like a small claims court, in proximity to all government service delivery centres. I am interested in your views. facts and establish the law or regulatory standard that should have been complied with by the state on our own. I must also hasten to indicate that in our case legality is not enough where state conduct results in patently unfair treatment or prejudice. During one stakeholder hearing an MEC who deals with RDP housing and related service delivery injustices said “it is wrong to treat the poor poorly”. Often believe that because we are giving a gift, a gift horse is not to be looked in the mouth. But we may cause harm through giving an inappropriate gift or delivering it inappropriately. In this regard some of the cases that come to my office are not pro bono matters but simple cases of poor treatment of the disadvantaged who have paid for legal services. Key among the trends we have picked up, is violation of people’s agency, mostly through the lawyer proceeding to approach a case without input from the client and even settling it without consent. It is important to remember that just because a person is not a lawyer, it does not mean they are not smart, insightful nor have a view on a matter that involves their lives. We should also be concerned about lawyers that feed the crocodile by defending the indefensible thus promoting maladministration and other forms of improper conduct, including corruption in state affairs. Apart from the fact that as a lawyer you are an officer of the court who must not mislead or allow the court to be misled, we are in the same boat. If you poke holes on my side of the boat, we’re both going to sink eventually, I may go first but you will follow. It has been said that an engaged people is least likely to resort to violence in disputes with those that are entrusted with state power. It is also true that for people to be engaged they must know. Legal assistance in all its forms, including legal education, is accordingly a meaningful contributor to an engaged civil society and the rule of law. certain your work is taking us in the direction of the South Africa we want, the Africa we want and the world we all yearn for. That is the state affairs where everyone’s quality of life is improved and potential freed. That is the Constitutional dream. Our collective efforts are also contributing to a society where there is accountability, integrity and responsiveness. Congratulations to the winners again. As a society we are grateful for your efforts in lifting others.